14 of the world's biggest video screens | What Hi-Fi? 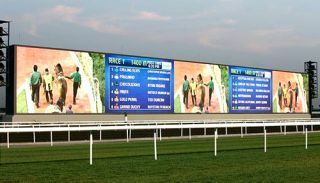 Churchill Downs racecourse in Kentucky has this week unveiled the world's largest Ultra HD 4K video screen. Panasonic was the firm responsible for building the huge LED screen at Churchill Downs, with the display measuring 171ft x 90ft. But there are bigger. And while we don't see consumer TV screens quite the large, shows such as CES and IFA always see plenty of monstrous TVs on display. We're not going to jump straight into the world of megalith screens without taking a look at the largest TVs you can conceivably squeeze into your lounge – so we start with this 110in Ultra HD 4K set from Samsung seen at IFA 2013. In your front room it would be huge, but it's not a patch on the big-screen video displays we're about to take a look at. This monster set from Panasonic must be a serious contender for the title of the largest TV built for the home. This 152in, Ultra HD 4K Plasma set could be yours for a cool £600,000 (and yes, they will come and install it). Sporting a 4K2K resolution and claiming a 5,000,000:1 contrast ratio, we certainly wouldn't mind checking out the black levels. We'll start saving. Now here's a screen that's "portable", but not exactly how you might be thinking. The adi iCONIC 100 is mobile in that the 100sq m LED display emerges from the back of an articulated lorry. Part of a family of mobile LED screens, the biggest model is the largest mobile LED screen in the world. Certainly puts a whole new perspective on TV on the go. Right, now onto the seriously huge screens. Boston's Fenway Park – home of the Red Sox and oldest Major League Baseball venue – installed three new Mitsubishi Electric Diamond Vision high-definition LED video screens in 2010, the largest (right) coming in at 100ft x 38ft (30m x 12m). Caesar's Palace Colosseum Showroom was originally built for a Celine Dion show at a cost of $95m. And no expense was spared, as the 110ft x 33ft (33m x 10m) LED screen shows. We're seeing a few former record holders appear as we move down this list, but here's one massive screen that could be biting the dust. Fact: the Coliseum is the first stadium to have hosted the Olympic Games twice. Here's another fact: it's home to a 150ft x 40ft (46m x 12m) high-definition video display. Daktronics is the firm who built it, and it made its debut in 2011. Need a better sense of scale? It would take approximately 1,686 x 37in screens to fill the same area of screen and if it was a consumer TV it would essentially be a 1863 inch television. Don't sit too close now. It's about time Japan made an appearance in this list, and Tokyo Racecourse does the honours. Mitsubishi Electric has certainly established itself in the world of large video screens, and this one takes us above 8,000sq ft (750sq m) – the size of three tennis courts. It reportedly cost 3.2bn yen and measures 218ft x 37ft (66m x 11m). And it was the world's largest HD TV back in 2006. The new home of the San Francisco 49ers isn't complete yet, but we already know that it'll feature two high-definition integrated LED video super systems; the largest of which is 200ft x 48ft (61m x 15m). They'll both be delivered by Sony Electronics in partnership with Daktronics. The stadium is due to open this year. Another racecourse, another gig for Mitsubishi Electric. Dubai's Meydan Racecourse is unparalled in size, but its 353ft x 37ft (108m x 11m) video display with 12 million high-luminance LEDs doesn't quite top the charts – not any more at least. But don't let that make you think it isn't still a serious sizeable screen. Now inside what's regarded as the top five and up above 20,000sq ft, we're off back to Texas. Unveiled just last month [March 2014], this is the world's largest high-definition video board. It's so big it even has a name: Big Hoss TV. This Panasonic video screen is 218ft by 95ft (66m x 29m) and, as you can see, dwarves pretty much all before it. A 1080p display, it crucially, for Texas, took the biggest HD screen title from the motor speedway track in Charlotte, North Carolina. The facade of two buildings at Hangzhou Tower Shopping Center sports a LED display covering more than 30,000sq ft by Daktronics. Completed in 2010, it also includes LED technology that has "the ability to present live and recorded video images". Try not to get distracted if you're just nipping out for a pint of milk. This Brazilian stadium has been refurbished for this summer's World Cup and part of that facelift includes something special – a huge LED display along the facade that'll measure 560ft x 66ft (170m x 20m). It'll be the largest LED stadium screen in the world once complete, boasting a total of 34,000 LEDs. Osram, the company behind the design, is certainly bullish about its work, saying: "We have not let ourselves be intimidated by FIFA’s strict requirements – on the contrary: our high-tech lighting solutions exceed the specifications by far." Should be good, then. We're unsure if the roof of the Bolshoy Ice Dome should qualify as a video screen, but we've opted to include it... because it's pretty crazy. Our Russian is, quite frankly, non existent but we've established that 38,000 LED modules cover the 26,000sq m roof area. And you'll notice that when it's not a colour display, it's a live scoreboard. Neat. As USA Today reported around the time of the Winter Olympics, the 34-year-old designer is certainly proud of his work. And so is his Mum. "The widespread fascination with the roof, which is irregularly shaped and looks like a white snow-cap during the day, has been a delight for Andrey Ustinov, the 34-year old native of Omsk who led a team of 20 architects and 70 engineers that built it. "The roof is our pride," said Ustinov. "My parents live in Siberia, and my Dad calls me and says, 'Son, call Mum, she's watching TV and crying.'"